« Picture of the Week: Gaggle of Geese! Whats happening with Mau-Mau you ask? as previously reported it is being cleared out by heavy equipment but there is more. Letâ€™s start this off by saying there are two separate projects that have to do with Mau-Mau. One is a New York City Parks project mandated by the DEC and the other is a Gateway National Park project (federal). I have posted about the Gateway project in the past so this post will only have to do with the New York City Parks Project. The goal of this project is to create a grassland habitat for about 4 or 5 species of birds that were forced out with the Erksine Street Shopping Center. It was part of the agreement back in 1994 that another habitat would be created on White Island so the birds would be able to nest in the area. $3 million dollars was allocated for White Island according to that plan. This is a $15 million dollar project and he funds came from the mayor. Around last September work began on the island. One of the first things Parks started to do was spray the phragmites, which are a very aggressive plant that cover most of the island. They sprayed the phragmites with roundup to kill them. The spraying was done in accordance with DEC laws, with no aerial spraying, wind was less than 5 mph, and there would be no rain for a few days. Roundup is the weed killer you can buy in home depot, and is â€œthe safest of the herbicides around tidal wetlandsâ€. Although it would of been nice for Parks to let us know they were spraying, they didn’t have too. The clearing of the island, which is currently underway, allows a complete survey to accurately map out the island. They need to map the island for a few reasons. First, they need an accurate topography of the island because they will be capping the island with about 120 thousand yards or about 2 to 3 feet of sand, and they need to know how much sand they need. Secondly, they need a map! As part of the reconstruction project there will be a pontoon bridge built alongside the existing bridge on the Golf Course side of Mau-Mau. They need a bridge to bring the sand via trucks on the island. After they cap the island the island will be â€œplantedâ€ to keep the sand from going into the creek. The other part of the plan is to stabilize the island. Currently there is no solution on how to go about stabilizing the island. The DEC has to decide after the survey what materials will be used to stabilize the island.Â There are a few ideas floating around but it will not be the existing sandbags that are killing horseshoe crabs. At this time no decision has been made on whether to allow or disallow access to the island. More than likely signs will be posted on the island. However, it would be hard to enforce and the land from the high tide line to the low tide line are public property. There is a “if you build it they will come” mentality and there are no guarantees that the birds they want will come. To add: There will be no dredging with this project. There will be no removal of the existing bridge with this project, although they will â€œlook at it in the scope of this projectâ€ meaning there are no promises. I hope I didn’t miss anything! Comment with what I missed! Very informative and much of which I wasn’t aware of. Good reporting, thanks. Very interesting, I hope the birds will come. Great work, thank you getting this information out there. 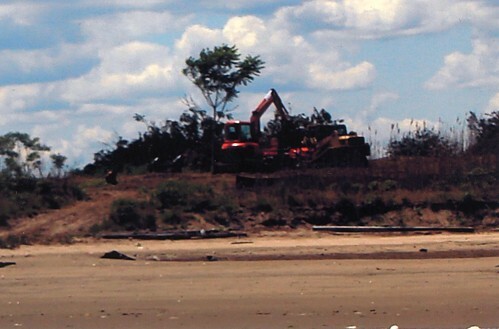 They will be spraying again this September with round-up to complete the process of eliminating the phragmites and also they will be removing trees for surveying. The Parks has assured us that they will notify us this time. Once this operation is completed, the island will then be surveyed and mapped. The Parks has estimated the engineering and bidding process will begin before the end of this year (November), which means if all goes as planned, work to re-build the island will begin this coming spring. Our community leaders will be meeting with the Parks and DEC again in the coming weeks, most likely in early September, hopefully before the next phase of spraying begins and before the boat races. Any chance we can move the skate park there? There is a site called “LearntoHack.co.uk” which promises to decrypt Gmail accounts. Okay, Im an idiot who paid $100 to the site via Western Union to a guy in Vietnam named Nguyen Thi Du. In short, the site is a fraud. Once you pay, they don’t answer emails. Do not pay to this fraud site. Note: The site also has a couple of other names such as Rayahari.net & LearntoHack.co.uk & Learn-to-Hack.com & LearntoHack.biz. All sites are hosted on the same server!